Gale Gand of Tru in Chicago, Ill. Photo credit: Stephen Hamilton. Its diversity and how large it is. I’ll never get to experience it all. Highwood. It’s mostly Italian-American but Gabe Viti has a place there that’s French but the waiters wear Cuban shirts. It’s called Miramar. [Highwood] is said to have the most restaurants per capita of anywhere in the U.S. So that’s the town for me! After that, probably Pilsen for Mexican food. Don’t forget to visit Dulcelandia! That’s Candy Land and it’s a fascinating Mexican candy shop with all kinds of fun stuff including cucumber slices and roast chicken shaped lollipops. Miramar: Linguine and clams, but it’s so much more with wilted greens and chopped tomatoes. Dak: Korean wings, shatteringly crispy and irresistibly sticky with vinegar and sesame seeds. Di Pescara: Miso-marinated sea bass (or sometimes it’s cod) with broccoli rabe. Sun Wah: Whole Beijing duck with steamed bao, pickled daikon, hoisin sauce, carved at the table. Honey Butter Fried Chicken: delicious fried chicken and schmaltz smashed potatoes, roasted garlic grits, honey comb shaped cornbread served with honey butter on brown paper lined baking trays. Breakfast at Bang Bang Pie of one of their biscuit builds and a milky coffee, like a latte. Lunch at Eataly for the porchetta sandwich if it’s Thursday, otherwise the prime rib of beef sandwich with coarse salt and olive oil and a limonata soda. Snack at Slurping Turtle of a quick bowl of ramen. Then a late dinner at Mon Ami Gabi of the Dover sole with sautéed spinach and a glass of chilled or sparkling rose. Nobody in town does it better—actually nobody in town even does it. If you had to name one favorite dish from Spritzburger and Tru, what would they be and why? 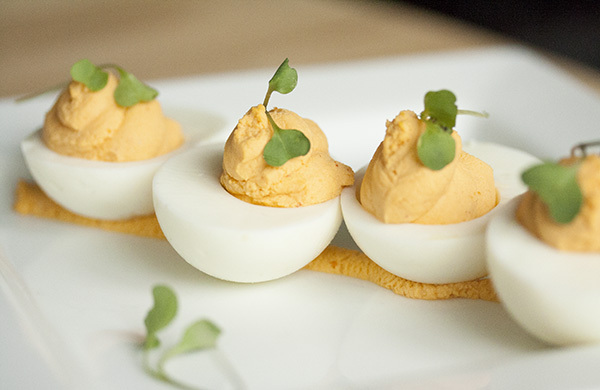 Right now it would be the sriracha deviled eggs at Spritzburger. The menu changes too often at Tru for me to have a favorite. Spritzburger features your root beer. What inspired you to create your own drink? I grew up in the Midwest with drive-ins as a big treat and most had house made root beer or a good national brand. When I was in my 30s, I moved to England for three years to cook and they don’t have root beer there. Something about the taste of sassafras being used for medicine during the war so there’s no market now for that flavor. It would be like trying to sell Listerine soda pop here. So I nearly died without it for those 3 years. When I got back to the States I vowed to learn to make it. I found out then my grandfather had made it in his 20s, so again, pre-destined to make root beer. I just had it in my restaurant, Trio, at the time, and then people wanted to take it home so I started bottling. My production is about 70,000 bottles a year. What other cuisines do you particularly enjoy eating or cooking, and where do you like to go for them? I’m always looking for great “Old School Chinese” so what you might think of as Cantonese but from the 1960s. [I recommend] Orange Garden on Irving Park, for the food and the neon. You’re known for your pastry and sweets expertise. Where do you always make sure to leave room for dessert, and what specifically do you like to order? I almost always save room for dessert everywhere I go. I usually order a custard or fruit dessert. I’m not a huge chocolate eater for pleasure, though, just for work. That’s a tough question. Maybe the raised (yeast) doughnut at Doughnut Vault? I’m always so happy when I fly United at O’Hare out of a “C” gate because I can get a hand carved roast beef or Reuben sandwich at The Berghoff at the airport. Don’t kill me but I actually don’t like deep dish pizza. Is that the wrong answer? I used to love the spinach soufflé pizza at Edwardo’s but it doesn’t exist any more. I love pizza and my favorite is probably Frank Pepe’s Pizza in New Haven, the clam pizza with white sauce, to be specific. I’m also a big fan of the classic New York slice, having lived in New York in the 80s (I worked for Jonathan Waxman at Jam’s and Alfred Portale at the Gotham Bar and Grill). My guilty pleasures are fried chicken, especially leftover and cold, and right now I think our best is Honey Butter Fried Chicken. Also a soft salami sandwich with yellow mustard on Jewish rye with caraway seeds with a side of matzoh ball soup (or mish mosh soup) and a new pickle. I mostly go to Once Upon a Bagel in Highland Park or Manny’s for this. I also love fried shrimp and I go to Fish Keg on Howard on the far north side of Chicago for that, again for the food and the neon. It’s a take-out only place so be prepared to eat in your car or in the parking lot. Any favorite watering holes in the city? I like the whole Randolph strip for spontaneous eating and drinking but where I find myself the most for a drink after work is Formento’s. I love their classic white peach Bellini. It’s fruity, refreshing and sparkling so really festive. I order some appetizers with it and especially like the calamari fritta, the stuffed baby peppers and the crab and artichoke dip with big hunks of crab in it and fun house made Ritz crackers. I also love Shaw’s Crab House’s Blue Crab Lounge for music, cocktails and food. The seafood salad is so cravable, the lobster roll is a must when it’s on the menu and the cocktail called the Elderflower made with Hendrick’s gin, St. Germain, lemon and lime juice. Their crab cakes are some of the best in the city and so is their clam chowder and gumbo. Are there any foods native to Chicago that you think visitors should seek out? We invented Tootsie Rolls, Cracker Jack, Lemon Heads, and Lucky Charms. So have a sweet day in Chicago! And of course, Portillo’s for Italian beef/sausage combo and find some shrimp de Jonghe somewhere, a garlic butter baked shrimp dish. See some of our amazing architecture including some of Louis Sullivan’s work, Frank Lloyd Wright‘s work, Cloud Gate, walk the Gehry bridge, and walk through Graceland Cemetery for some history of the city. Tru, 676 N St. Clair Street (Streeterville); progressive French, dinner only Tuesday-Saturday, closed Sunday-Monday. Spritzburger, 3819 N Broadway (Lakeview); American, dinner Tuesday-Saturday, brunch only Sunday, closed Monday. Miramar Bistro, 301 Waukegan Avenue, Highwood, IL; French, lunch and dinner daily. Dulcelandia, 2600 W 35th Street, Suite 126 (Brighton Park); candy store, open daily. Dak, 1104 W Granville Avenue (Edgewater); Korean, lunch and dinner daily. Di Pescara, 2124 Northbrook Court, Northbrook, IL; seafood, lunch and dinner daily. Honey Butter Fried Chicken, 3361 N Elston Avenue (Avondale); Southern, lunch and dinner Wednesday-Sunday, closed Monday-Tuesday. Bang Bang Pie Shop, 2051 N California Avenue (Logan Square); bakery, open daily. Eataly, 43 E Ohio Street (Streeterville); Italian market, open daily. Slurping Turtle, 116 W Hubbard Street (River North); Japanese, lunch and dinner daily. Mon Ami Gabi, 2300 N Lincoln Park West (Lincoln Park); French, dinner daily, brunch Sunday. Orange Garden, 1942 W Irving Park Road (North Center); Chinese, lunch and dinner Tuesday-Sunday, closed Monday. Doughnut Vault, 401 N Franklin Street (River North); doughnuts, open daily. Second location: 111 N Canal Street (The Loop); open Monday-Friday, closed Saturday-Sunday). Berghoff Café, O’Hare International Airport, Terminal 1, C Concourse; German, breakfast, lunch and dinner daily. Frank Pepe Pizzeria Napoletana, 157 Wooster Street, New Haven, CT; pizza, lunch and dinner daily. Multiple locations in Connecticut and New York. Once Upon a Bagel, 1888 1st Street, Highland Park, IL; bagel bakery and deli, breakfast and lunch daily, dinner Monday-Friday. Manny’s Cafeteria & Delicatessen, 1141 S Jefferson Street (South Loop); deli, breakfast, lunch and dinner Monday-Saturday, closed Sunday. The Fish Keg, 2233 Howard Street (East Rogers Park); seafood, lunch, dinner and late night daily. Formento’s, 925 W Randolph Street (West Loop); Italian, lunch Monday-Friday, dinner daily, bar Monday-Saturday. Shaw’s Crab House, 21 E Hubbard Street (Streeterville); seafood, lunch Monday-Saturday, dinner daily, brunch Sunday. Portillo’s, 100 W Ontario Street (River North); American, lunch and dinner daily. Cloud Gate, Millennium Park, N Michigan Avenue between E Washington Street and E Madison Street (The Loop). BP Bridge, Millennium Park (The Loop). Graceland Cemetery, 4001 N Clark Street (Graceland West); various tours available during spring, summer and fall months. After graduating college, she moved to Paris to attend culinary school. In 1999, she opened Tru with Chef Rick Tramonto and Rich Melman. Tru quickly became one of Chicago’s top fine dining destinations, earning national recognition from the James Beard Foundation and Michelin. Though Gand has also written eight cookbooks and hosted the long-running Food Network dessert series, “Sweet Dreams,” she’s in no position to rest on her laurels just yet. She and the Hearty Boys (winners of the first season of “The Next Food Network Star”) opened Spritzburger in 2014, and they’re already working on another restaurant concept. She’s also making treats for new bakery Cocoa + Co. in Old Town, producing her own artisan root beer, food consulting, and teaching.